Home / Blog / What Can Optical Comparators Do For You? What Can Optical Comparators Do For You? Optical comparators are used to magnify an image of a part to gather a tremendous amount of information about that particular part in a short time. For those who are not very familiar with these kinds of machines, optical comparators are measurement tools that magnify images onto a glass screen using mirrors, lenses, and illumination sources for the purpose of making two dimension measurements. Optical comparators have been used for more than five decades and they still remain a cost-effective and versatile technology for monitoring the quality and processes of a wide range of manufactured parts. Over the years, optical comparators have evolved into full-featured equipment that uses modern optical, electrical and mechanical technology to maximize cost savings and minimize inspection time. So, why should you invest in optical comparators? You can use optical comparators to gather simple length and width measurements. However, you can get more information about a manufactured part apart from dimensions. You can use the optical comparators to detect undesirable chamfers, indentations, scratches, or burrs by checking the magnified image of a part. In addition, the screen of a comparator can be viewed by multiple people and provide a medium for discussion. 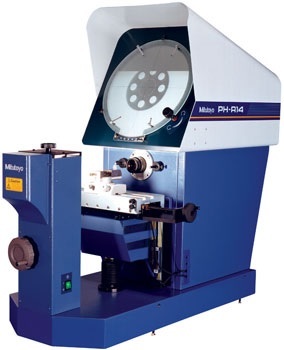 Unlike calipers and micrometers which are used to measure one dimension at a time, optical comparators are used to measure widths and lengths simultaneously. In order to do this, the operator lines up the screen centreline with the lower left-hand corner of the image to establish a zero point to get a simultaneously reading of both width and length. The optical comparator is able to obtain the straight-line distance with a single keystroke. This is a key advantage of why you need to invest in optical comparators. When measuring a part using comparators, only the light touches the part, meaning that no other direct forces are involved in the process that can change the shape of delicate parts. Unlike hand gages, noncontact gages eliminate the feel factor which can easily result in human error. Optical comparators are easy to use and their ergonomic designs reduce operator fatigue, retraining costs and the inspection, all while increasing throughput. The costs involved in parts setup times and handling are significantly reduced since comparators generally allow each part to be viewed in 2-D in one orientation. Custom hard gages, unlike optical comparators, need frequent recertification and are subject to wear which takes them out of service. Additionally, hard gages are inflexible and in case of minor product design changes, they would require costly modifications or rendered obsolete. On the other hand, optical comparators are easily adaptable to design changes, are general-purpose measurement devices and they are appropriate for either repetitious inspections or first-article. As mentioned earlier, optical comparators are used in different industry applications to measure manufactured parts around the world. They are available with numerous options and features to suit many applications. They can be used in machine shops, final inspection areas, assembly and production floors and R&D labs just to mention a few. Their return on investment, range of capabilities and versatility make comparators integral and indispensable to any quality plan.